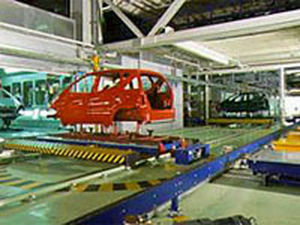 The skid loaded with a vehicle body is transported chiefly on roller conveyors in longitudinal direction through body shop and paint shop. Features: Driven directly at the plastic-coated friction wheel; low-maintenance and low-noise. 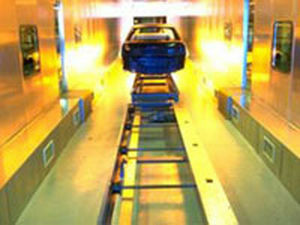 Cross transfer cars allow distribution of vehicle bodies over several parallel lines. They are a "must" in reversing mode. 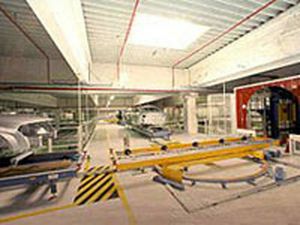 Features: Low-noise and low-wear drive by plastic-coated wheels. 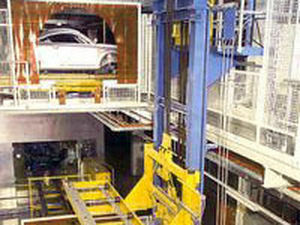 Bodyshell lifts convey the vehicle bodies vertically, thus allowing them to reach the various levels of the production shop. Features: Two lift belts, low-maintenance and low-noise; counterweight for counter-balancing, minimum motor output required, stand-by drive can be activated easily.